I typically make a big ole salad for at least one of my daily meals. Such as the the case with this Buffalo Curls Kale Salad. This salad developed out of love for a pre-vegan food. I’m not shammed to admit it, my go-to junk food was chicken wings. Somehow the paired carrot and celery sticks made it semi-healthy, so I thought. Yep, I was a Hooters girl! Well not as in working there, but as a devout customer. Bleh, I know (insert sad face)! I didn’t stop eating chicken wings though because I didn’t like them, I stopped because I don’t want to consume animals. The beauty of vegan food is I can recreate and enjoy the same flavors, while removing the cholesterol, fat, and calories associated with animal products. It’s a win for me and the animals. The avocado (good fat) is used to soften the kale and add flavor. I didn’t want to over-power the salad by drowning it in blue cheese dressing. I only used a tablespoon per serving. The celery gives the salad texture and if I would have had carrots on hand, I would have shredded them and added too. Soy curls are really magical and if you haven’t tried them you need to soon. They really have the texture of chicken and can be used in so many recipes as a replacer. I order mine from Amazon and keep them stored in the freezer (they can go racid) until ready to use. I cook the whole package, which gives me leftovers I can use in another salad, wrap, taco, buddha bowl, etc. The salad would make a great accompaniment to your football playoff spread or Super Bowl Party. You can feel better about serving it too knowing no animals were harmed in the making. Hooters has nothing over this man. This hearty salad is packed with flavor from the avocado kale to the blue cheese dressing. What ties it all together is the kick in the buffalo sauce and the surprising crunch from the celery. Squeeze the water from the soy curls with tongs, then place the curls in a dry bowl. Add the chicken salt and mix well. Give the air fryer basket a couple of sprays of avocado oil. Put half the soy curls in the air fryer basket and cook on 390 degrees for 8 minutes, removing the basket a couple of times to shake. Meanwhile, put Frank's sauce and the butter in a saucepan and heat on medium-low. Once the soy curls are done, remove them from the air fryer basket and place them in a bowl, then add 1/2 of the Frank's sauce to the cooked curls and stir until well coated. Put the sauced curls back in the air fryer basket and cook at 390 degrees for an additional 6-8 minutes, shaking the basket a couple times. Once done, remove the curls from the basket and sit aside. Repeat the process with the remaining half of the soy curls. While the curls are cooking, put the kale pieces in a large bowl, add the avocado and salt, and massage into the kale with your hands until the kale softens. Add the celery and combine well. 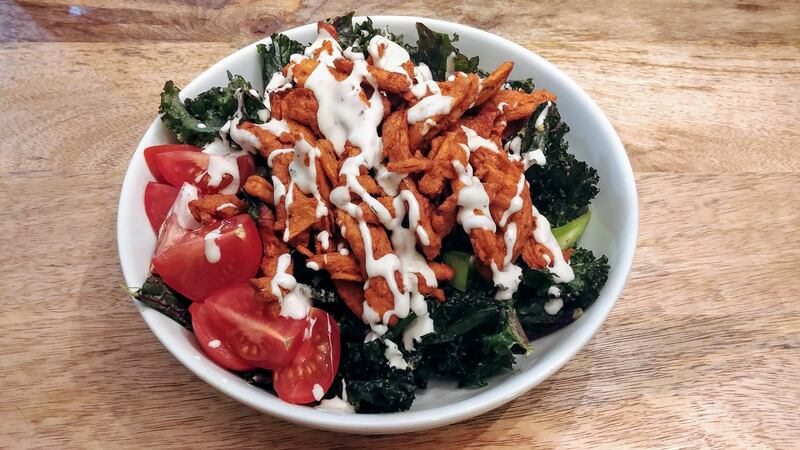 To serve, place a serving of the kale mixture into a bowl, top with desired serving of buffalo curls, drizzle with blue cheese, garnish with tomatoes.